These shiny, chrome-plated brass double point needles are cuboid-shaped, making them ergonomically advantageous for knitters in search of better grip AND more uniform stitch definition! These features, in combination with their perfectly tapered tips, result in a double point needle set ideal for small projects like socks and hats, but are lightweight enough to ensure comfort in the hand and hours of stress free, satisfying knitting. 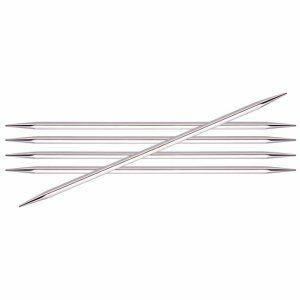 Knitter's Pride Zing Double Pointed Needles and ChiaoGoo Double Pointed Needles are both similar needles: 6" / 6.5", double point, and US 9 (5.5mm) US size. You may enjoy taking a look at the Tahki Stacy Charles Cotton Classic Katja Baby Top, and Manos Del Uruguay Gloria Cobre Mitts kits all using Knitter's Pride Nova Cubics Platina Double Point Needles.